A wide range of antisera for Salmonella, Shigella, Yersinia and Coli diagnosis. Test reagents are composed of a mixture of rabbit antisera and monoclonals or solely of monoclonals. 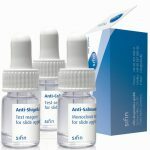 Sifin also supply Blood Grouping reagents, Culture Media, Additives and Supplements.